In 2008 the students of Red Deer Lake School entered their brand new building south of the city of Calgary, AB. Two years later, some of the leadership students were having a discussion about global citizenship and the question was posed, "Wouldn't it be great if we could build a school in Africa?" Build a school in Kenya to help other children create a future filled with opportunity, beginning with a sound education. Help Canadian children learn that they have the ability to do anything they set their minds to – even when it is a half a world away. 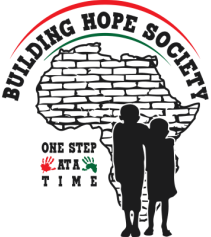 When the Building Hope Society was formed, Rick Castiglione, a Calgary documentary maker, introduced The Building Hope Society to our partners in Kenya, founders of The Nairoshi Foundation, the husband and wife team Kamishina (David) Ole Nkuito, and Merry Purcell-Nkuito. This relationship, between Merry Purcell, David Ole Nkuito and the Building Hope Society, is one of the cornerstones of the success of this project. The Building Hope project remains successful and forward moving due to the incredible hard work and oversight of Merry and David. David and Merry own and operate Enaidura Big Step Safaris . Visitors to the project receive top level care from them and they receive incomparable treatment from them on their safaris. Recently one member of the board of the Building Hope Society wrote this at the end of her trip. "Goodbye and thank you so much Kenya. If you are interested in heading to Nairobi or Kenya for a Safari contact Enaidura Big Step Safari. They will do everything to make your stay spectacular, safe, fun and just what you want it to be!!! I do feel like I left part of my heart in the Maasailand."